For the second stage of the DPOC project Oxford and Cambridge have started looking at policy and strategy development. As part of the DPOC deliverables, the Policy and Planning Fellows will be collaborating with colleagues to produce a digital preservation policy and strategy for their local institutions. Edith (Policy and Planning Fellow at Oxford) blogs about what DPOC has been up to so far. Last Friday I met with Somaya (Policy and Planning Fellow) and Sarah (Training and Outreach Fellow) at the British Library in London. We spent the day discussing review work which DPOC has done of digital preservation policies so far. The meeting also gave us a chance to outline an action plan for consulting stakeholders at CUL and Bodleian Libraries on future digital preservation policy development. Much work has already gone into researching digital preservation policy development [see for example the SCAPE project and OSUL’s policy case study]. As considerable effort has been exerted in this area, we want to make sure we are not reinventing the wheel while developing our own digital preservation policies. We therefore started by reading as many digital preservation policies from other organisations as we could possibly get our hands on. (Once we ran out of policies in English, I started feeding promising looking documents into Google Translate with a mixed bag of results.) The policy review drew attention to aspects of policies which we felt were particular successful, and which could potentially be re-purposed for the local CUL and Bodleian Libraries contexts. My colleague Sarah helped me with the initial policy review work. Between the two of us we read 48 policies dating from 2008-2017. However, determining which documents were actual policies was trickier than we had first anticipated. We found that documents named ‘strategy’ sometimes read as policy, and documents named policy sometimes read as more low level procedures. For this reason, we decided to add another 12 strategy documents to the review which had strong elements of policy in them. This brought us up to a round 60 documents in total. So we began reading…. But we soon found that once you are on your 10th policy of the day, you start to get them muddled up. To better organise our review work, we decided to put them into a classification system developed by Kirsten Snawder (2011) and adapted by Madeline Sheldon (2013). Snawder and Sheldon identified nineteen common topics from digital preservation policies. The topics range from ‘access and use’ to ‘preservation planning’ [for the full list of topics, see Sheldon’s article on The Signal from 2013]. I was interested in seeing how many policies would make direct reference to the Open Archival Information System (OAIS) reference model, so I added this in as an additional topic to the original nineteen identified by Snawder and Sheldon. Interestingly, after we finished annotating the policy documents we did not find a correlation between covering all of Snawder and Sheldon’s nineteen topics and having what we perceived as an effective policy. Effective in this context was defined as the ability of the policy to clearly guide and inform preservation decisions within an organisation. In fact, the opposite was more common as we judged several policies which had good coverage of topics from the classification system to be too lengthy, unclear, and sometimes inaccessible due to heavy use of digital preservation terminology. In terms of OAIS, another interesting finding was that 33 out of 60 policies made direct reference to the OAIS. In addition to these 33, several of the ones which did not make an overt reference to the model still used language and terminology derived from it. So while we found that the taxonomy was not able to guide us on which policy topics were an absolute essential in all circumstances, using it was a good way of arranging and documenting our thoughts. What this foray into digital preservation policies has shown us is that there is no ‘one fits all’ approach or a magic formula of topics which makes a policy successful. What works in the context of one institution will not work in another. What ultimately makes a successful policy also comes down to communication of the policy and organisational uptake. However, there are number of high level principles which the three of us all felt strongly about and which we would like to guide future digital preservation policy development at our local institutions. Principle 2: Policy also needs to be high-level enough that it does not require constant re-writing in order to make minor procedural changes. In general, including individuals’ names or prescribing specific file formats can make a policy go out of date quickly. It is easier to change these if they are included in lower level procedures and guidelines. Principle 3: Digital preservation requires resources. Getting financial commitment to invest in staff at policy level is important. It takes time to build organisation expertise in digital preservation, but losing it can happen a lot quicker. Even if you choose to outsource several aspects of digital preservation, it is important that staff have skills which enables them to understand and critically assess the work of external digital preservation service providers. What are your thoughts? Do you have other principles guiding digital preservation policy development in your organisations? Do you agree or disagree with our high-level principles? This entry was posted in policy, strategy by ehalvarsson. Bookmark the permalink. I had not come across Kirsty’s Policy Matrix before and will make sure to look out for the University of Edinburgh’s new DP policy. We differentiated policy, strategy and guidelines based on the level of granularity they had. Policy generally contains principles for preserving digital content, these should be high level and system agnostic. They will usually state what mandates an organisation has for preserving digital content and its commitment to digital preservation. Although policies are regularly reviewed, core principles are unlikely to change drastically. We identified documents as ‘strategy’ when they were more time specific and focused on implementation. Strategy will usually state a number of core/urgent areas to address and set a time period for identification or implementation of solutions. Strategy goes hand in hand with policy, as it essentially underpins how an organisation will work towards complying with policy principles. We identified documents as ‘guidelines’ if they were very prescriptive and system specific. Because they provide more detail around how you practically undertake tasks, they also require more frequent updates. Depending on the audience (public vs. internal) they can be more technical in the language used to avoid ambiguity. So while I would avoid digital preservation specific language at policy level, using it in guidelines for staff can be useful since it makes your statements more precise. Although it is also important to define what you mean by/how you are using digital preservation terms within your organisation. 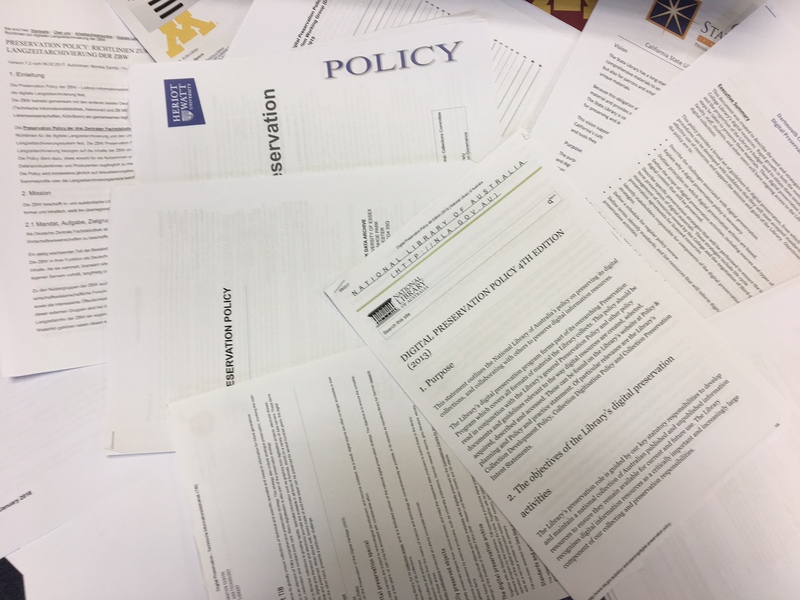 However, my sense from reading these documents is that there will sometimes be good reasons why an organisation choose to write a policy-like document but label it ‘strategy’ and vice versa. If you are in urgent need of putting a policy into place and the policy ratifying process is drawn out in your organisation, labelling it strategy instead can be a way of getting around this. On the same note, some organisations might call their guidelines ‘policies’ as a way of forcing compliance among staff. I would be happy to share the list of policies we looked at. If you drop me an email at edith.halvarsson [at] bodleian.ox.ac.uk I will forward it to you. Do you have clear definitions for “strategy”, “policy”, “low level procedure” documents? If not, how did you distinguish between them? Furthermore, would you be willing to share the list of the 60 documents you looks at?